"Oh buddy ! C'mon in !" I would have loved this shot with another squirrel in the frame, which it was calling in for a snack.Both squirrels guess are best friends for life as I see them running around together rain or shine. Though I just took one shot, they kind of got conscious of me around, and I just left the scene .I thought my daily is definitely not important than their snack or privacy ! Thank you everyone for the comments on yesterday's daily. Really appreciate each and every comment. What a wonderful and different twist! nice shot,,, they do like bird feed don't they..
A squirrel on a squirrel feeder! Kind of like your average man, if they are hungry, they will figure out a way to eat. WOW! This is a fantastic shot. You were sweet not to disturb them! 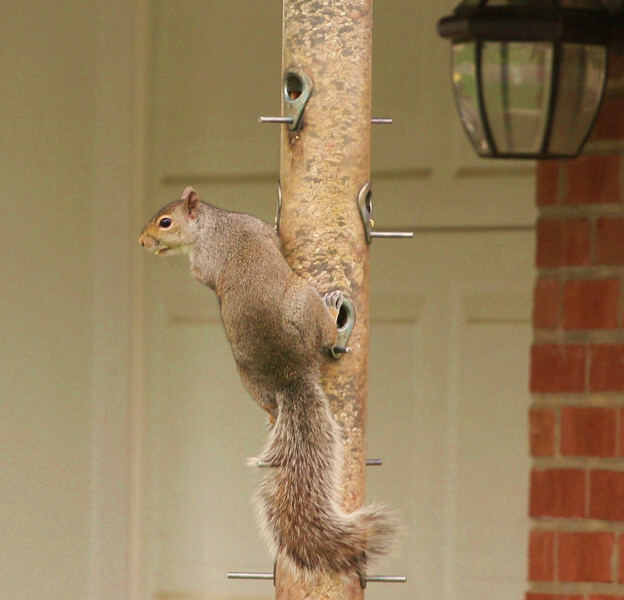 So many people think squirrels are a nuisance, but I rather enjoy watching their antics. They're smart little creatures, too! LOL @ caption! Terrific shot! Love the quote! Nice shot.